As the cruel taunts aimed at Liverpool captain Steven Gerrard will have reminded Manuel Pellegrini, one slip is all it can take to derail even the smoothest route to the Premier League title. Manchester City, however, surely have their rivals exactly where they want them as the season enters its final week, after a grinding, unspectacular but priceless win at Everton. Pellegrini's side are top of the table once more, with home games to come against Aston Villa and West Ham United, and with a superior goal difference over closest rivals Liverpool, who travel to Crystal Palace on Monday. The Chilean would surely have signed up for this in August - but with the deadpan delivery that has become his trademark, he issued the message of caution he wanted his players to hear. And while City celebrated the final whistle of the 3-2 win at Goodison Park in the manner that reflected its importance, there were also signs that suggested Pellegrini's words of warning were well justified. City got over the line, but there were times when they looked jaded and short of inspiration, not helped by another early departure for their outstanding Argentine striker Sergio Aguero. They are now very firmly in charge of their destiny but, just occasionally, there were indications of a drop in level that still offered the slightest encouragement to Liverpool and Chelsea. The bottom line remains that City got the job done in what was widely regarded as the biggest trap left for them this season, at a ground where they had won once in their previous 15 visits. It was a win achieved in an unusual Goodison Park atmosphere, played out against the backdrop of Everton potentially offering rivals Liverpool a way back into the title race if they could continue their recent outstanding record against City. There was no suggestion Everton's players were lacking in effort, which would be a complete insult to some model professionals, but perhaps the edge of intensity had gone as hopes of the Champions League receded even before kick-off before being snuffed out completely. Defeats for Tottenham and Manchester United more or less assured Roberto Martinez's side of fifth place even before the game got under way, and the bear-pit atmosphere that usually makes Goodison such an uncomfortable place for opponents was also absent. There were no scenes of revelry at Everton's defeat - and its ramifications for Liverpool - from own fans but it did not appear to be a loss they would linger too long on, especially when they reflect on such an outstanding first season in charge for Martinez, who was given a loud and prolonged standing ovation when he reappeared after the final whistle. One player who did his utmost to provide Everton with the win that would also have been cheered across Stanley Park, and who presented an utterly convincing case for his inclusion in England's World Cup squad, was Ross Barkley. There is a feeling Barkley may miss out because the England camp feel he is running on empty. In front of watching national boss Roy Hodgson, the tank was full and he stood head and shoulders above every other player on the pitch. From a magnificent opening goal - an instant, curling 25-yard effort past City keeper Joe Hart - to an unstoppable surging run that almost set up an equaliser for Steven Naismith, it was a complete performance. And his goal alone demonstrated the X-factor he could bring to England, the sort of game-changing ability that may come in rather handy for Hodgson and England in Brazil. It was quite the conundrum for Hodgson. If he had ruled Barkley out of his World Cup plans, he must surely be harbouring second thoughts. This will, of course, not matter to Manchester City. 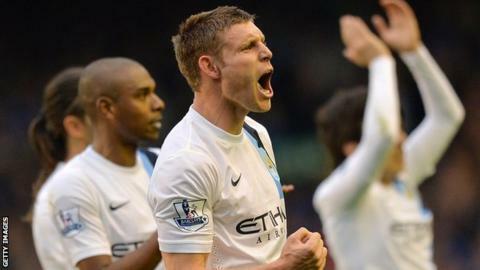 Aguero's goal and two either side of half-time from Edin Dzeko put them in sight of a second title in three years. Pellegrini's grim expression was as far away from triumphalism as it gets. This display fell some way short of fully convincing, and this season has been playing tricks since August. And Pellegrini has known disappointment before in his fine career. What is without dispute is that if City lose the title by failing win home games against Villa and West Ham, there can be no excuses. Pellegrini has his rivals exactly where he wants them. Six, although if Man City win their remaining two matches, City will almost certainly take the title on goal difference. Three, although if City or Liverpool win either of their remaining two games then Chelsea cannot win the title. Six will will at worst win the title on goal difference regardless of other teams. They could win it with four points if Liverpool fail to win one of their games.